Noodle is a lovely little panda. He loves lots of things. 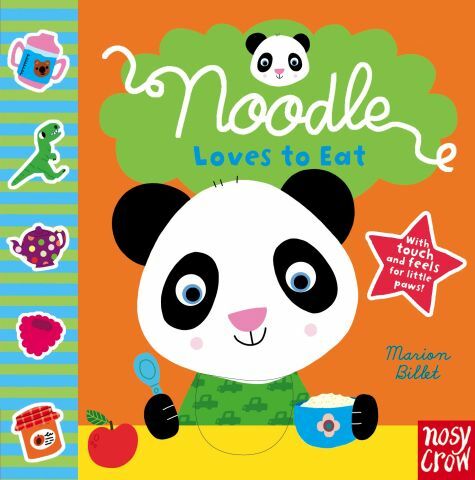 And in this chunky and bright Noodle book he loves to eat! I know my daughter can use as much encouragement as possible to explore food and healthy eating. This Noodle book is a great way to start early with your little one. More touch and feel textures to explore and discover too, including soft, fluffy bread and bumpy peas. The last page is a mirror for the little reader to see their own precious face in the story. Marion Billet has written a sweet little verse which is a great starting point for the life long love of books. Another delightful, age appropriate development book from the wonderful Nosy Crow. This time for the youngest of book lovers babies to toddlers. Never too early to enjoy a book and Noodle is a great place to start! See also Noodle Loves to Cuddle and Noodle Loves the Beach.